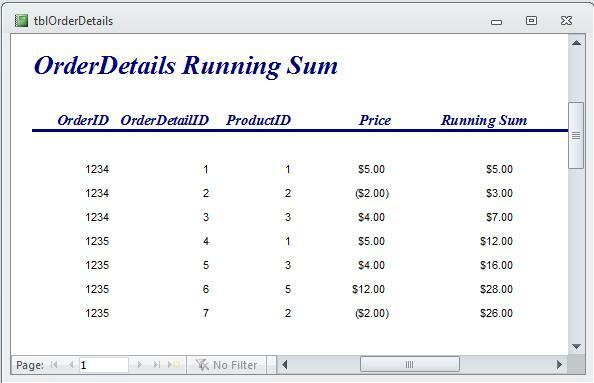 One thing that is easy to do in a report, but difficult to produce in a query, is a Running Sum. A running sum adds the value of a field in a record to the value of the same field in the previous record. But it's not so easy in a query. The problem is that SQL does not have positional notation like Excel does. There's no way to simply point to the record above the one you're on. The only way to do it is to somehow identify the previous record in terms of a Where condition. Since this Where condition must be evaluated for each line, I can do this with a domain aggregate function (DSum) is ideal. For this method to work, I must have a unique record ID. The Autonumber field is ideal for this. It doesn't matter if there are gaps in the sequence, but I have to sort on this field, so there cannot be duplicates and they must be in the order I need displayed. In the above sample, OrderDetailsID fits the bill. 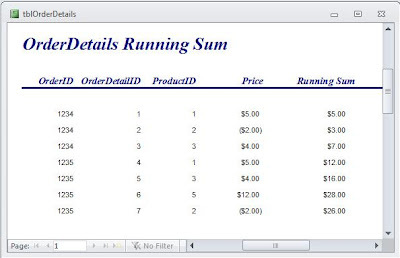 Over each group, where the running sum resets to zero as the Order ID changes (see Figure 5). There are two methods to create a running sum: DSum domain aggregate function and a correlated subquery. I'm going to concentrate on the DSum method here. The DSum function works much the same as the DCount in the Numbered Query example, but instead of counting the records, it sums them. Unfortunately, the DSum does not return a formatted number. Both types of running sum can also be done with correlated subqueries. I may discuss this at a later date. 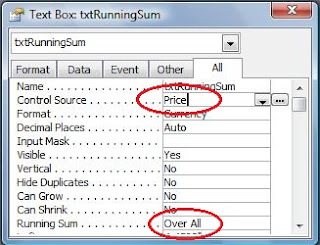 However, you can find both methods on my website, in this sample: RunningSumInQuery.mdb. =OnHand-Usage where the starting balance Onhand is at the top of the column and begins subtracting the usage for each day. I don't know if this blog is still active, but I'm trying to create a running sum using DSum, for a work project. The structure of the problem is the same as your example,in fact I've just copied and pasted the code, changing only the field names,but I can't get it to work. When I run it as a select query the running sum column returns errors, and when I run it as an update query (my preferred option)I get an error message saying "didn't update [all] fields due to a type conversion failure." I've changed all working fields to type long integer, so this shouldn't be a problem, but it keeps recurring. From google I can see that this is a somewhat common problem, but can't find a clear solution. Do you know if there's a way of fixing this? It's a very large table- 19112509 rows. Thanks for not just recopying the same material of DSum that I seen many times. This is much clearer; therefor, I understand it more. Thanks a lot, you gave me the right syntax of Dsum ! Thanks a lot, you gave me the right syntax of Dsum. You saved me day !